petition: USDA - IT'S TIME TO REVOKE HUGO LIEBEL'S LICENSE, NO LONGER ALLOWING HIM TO USE NOSEY/TINY FOR PERFORMANCES AND RIDES IN HIS CIRCUS OR ELSEWHERE!! USDA - IT'S TIME TO REVOKE HUGO LIEBEL'S LICENSE, NO LONGER ALLOWING HIM TO USE NOSEY/TINY FOR PERFORMANCES AND RIDES IN HIS CIRCUS OR ELSEWHERE!! This update is forthcoming in addition to the already presented petition below. Due to the recent events in the State of Alabama, where Hugo and Franciskza Liebel have both been charged, arrested and bailed to appear before Lawrence County District Court on February 8, 2018 on Animal Cruelty Charges. The seizure of both the elephant known as Nosey, on November 9, 2017, due to being found by Animal Control Officer, Kimberly Carpenter, in a state of distress (shown by persistent swaying), tethered tightly being unable to move and standing in her own faeces and urine with no sign of sustenance or water, and four ponies (Midnight, Stardust, Hotshot and Rascal), (who were 5 weeks later returned to the Liebels at the State of Alabama's insistence, stating they had no further requirement for the ponies to continue to be seized and awarded them back to the Liebels). We bring your attention to all that has since the Bench Trial of December 15, 2017, come to light. Since seizure and custodial care being given to The Elephant Sanctuary Tennessee (TES), Nosey has been tended to by a veterinarian staff on a daily basis which from day one examination has seen her to have osteoarthritis/systemic progressive musculoskeletal disease. She had on arrival a urinary tract infection (UTI) and roundworms, which have both now been treated and are regularly monitored. She suffered excessive discharge in her eyes. She chews primarily on the right side of her mouth so oral tests need to be performed. Her skin condition (also known as hyperkeratosis (a build up of extra skin) was bacteria filled and, by the account of "her lifetime vet" Mark Wilson, DVM, in testimony, at said Bench Trial had been a problem for over 20 years. Over 20 years of a probable life threatening skin condition, under the supervision of a purported qualified DVM, yet never resolved or treated appropriately. So much so it has been deemed now necessary to receive a daily care regime, which it now does at TES. Given all of the above and the fact that although the ponies were awarded back to the Liebels, in a good and healthy condition, having spent 5 weeks at a rescue, the Liebels took them home to Florida and all four plus carriage horses were back "working" for the Liebels giving rides both saddleback and carriage respectively over the Christmas period. Both appear weary and torn. But mostly the ponies as they had tasted 5 weeks of freedom and had it ripped from them and were forced back to working immediately they arrived back in Florida. Further to the requests we have signed for below, we demand that the USDA revoke the license for Hugo Liebel and/or his family to keep animals of any kind for the use of entertainment/ display/ rental or exhibition for his/their lifetime, without reservation. Given the nature of all that Nosey, the ponies, horses, spider monkeys and two other recorded elephants have endured both past and present, we look to yourselves to make sure the future is brighter and one of freedom for all those animals still in the ownership of the Liebel family. We, the general public and advocates, from around the world, for Nosey aka Tiny aka Peanut aka Dumbo aka Bubbles (yes Hugo Liebel uses all of those names) an African elephant captive and owned by one Hugo Liebel aka Hugo Bloom aka Tomi Liebel aka Tommy Liebel demand that the USDA revoke the license of the above-mentioned (currently USDA License No. 58-C-0288). You, the USDA, have to date received countless emails, videos, letters and telephone calls regarding the plight of this poor ailing elephant. For almost 30 years she has been performing and giving rides with the Liebel Family Circus aka Liebeling Brothers Circus aka The Great American Family Circus aka Florida State Family Circus. You, the USDA, have cited over 200 times, the above-mentioned for their poor treatment and care of Nosey and other animals in their ownership. Nosey (or by whatever of the above-mentioned names) suffers from severe arthritis, degenerative joint disease causing impaired limb movement. Her pain is exacerbated by the countless rides she gives before and after each performance. During her circus performances she is made to crawl across the ring on her "knees". In her performances she is made to stand on hind legs performing various tricks and also carries members of the Liebel circus troupe via a swing hanging from her tusks. She is made to carry another member on her back, who performs acrobatic stunts on and from her back. Elephants' spines grown upwards, not flat, so are not presented in a way to take the constant pressure of a chair or acrobatics performed over such. "Nosey is a crippled female African elephant sanctioned by USDA/APHIS to be kept in circus chains her entire life under the fear of the bull hook, guide or whatever you want to call it. 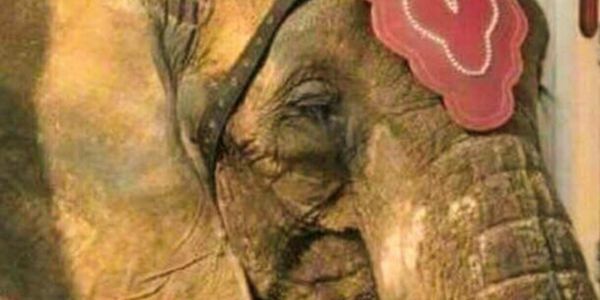 USDA/APHIS must correct this longstanding injustice, stop their lip service, grant Nosey her freedom, take away the pain, and revoke their agency's permit which serves only to prolong her suffering." – Philip K. Ensley, DVM, Dipl. ACZM"
It has been noted in recent video and still photos that Nosey appears to be suffering from "swayback". The indentation in her back is clearly visible and is such as a result of the weight of the chair and persons she carries for rides each and every day. Nosey spends her time between venues in a rusty and unclean cramped trailer with tools and equipment behind and alongside her, restricting any possible movement. She has been recorded as enduring high Floridian temperatures whilst languishing in the cramped and airless trailer. No door or ventilation was left open at the time of recording. Recent photos have seen her standing in her own urine. The smell disgustingly strong. Her owner not more than a few feet away, not attending to the need for cleanliness. Her skin is visibly dry and cracked, especially noticeable on her forehead, when she is not wearing a headdress to cover it. She has an ongoing eye condition, which produces a white discharge, again visible to those seeing her up close. Nosey's evident lameness is not just a reminder to us all how painful it is for her to continue performing and giving rides, but also a valid warning. When watching her falter, almost stumble, with people on her back, mainly children too... that they could easily, if she fell, be injured, maimed, crushed or even killed under her weight. Nosey is just 35 years old, but presents as a much, much older elephant. Walking in endless circles giving rides is not only bad for her physical gait but for her mentally too. Recent stills from a media report show that the chair used for rides is ill fitting, not sitting appropriately and would appear a safety hazard. This IS a tragedy waiting to happen. We are bringing to your attention that elephants in captive situations show the inherent bobbing and swaying aka "weaving" which is known as stereotypic behaviour. Wild elephants don't develop this behaviour as they are constantly stimulated by their natural surroundings and life with the herd. This behaviour in captivity is born of stress, trauma, boredom, frustration and desolation and although prevalent in lone elephants, is also seen with groups of captives, as by being chained, they are unable to reach social stimuli in their group, i.e., touching and body movement. Once a captive elephant reaches the point of stereotypic behaviour, which again can be shown in swaying/weaving, bobbing, lifting and lowering legs, swaying of the trunk and circling of the head, they have literally reached the point of no return. It has been noted that Nosey is experiencing such motions and video evidence can be seen to prove such, especially getting worse over recent months. It is known that although stereotypic behaviour isn't directly harmful to Nosey, in the long term the continual rocking motion will be detrimental to her already arthritic joints and cause further pressure pain to the soles of her feet and her toenails. We are signing this petition in the hope that you, the USDA, stand firm and revoke Hugo Liebel's License to allow Nosey to continue performing and giving rides. NOW is the time for her to retire and hopefully be given over to a sanctuary where she can see the remaining years of her life with her own kind. We implore you Mr. Perdue to do for Nosey what Tom Vilsack refused to do. Have compassion, see Nosey's ailing body and the torture she endures each and every day and let her be FREE. On November 9 in Lawrence County, Alabama, Nosey was seized from the Liebels and taken to The Elephant Sanctuary, Tennessee. Since that time she has been seen foraging for browse and enjoying a chain free, bullhook free, food and water in abundance life. Dare we dream that this IS her future of FREEDOM. Hell yes, we do! And whilst we still draw breath we WILL be a VOICE for Nosey. Please continue to SIGN & SHARE this petition. The USDA need to know that we will NEVER give up on our girl, Nosey. "THE ELEPHANT SHOW FOR TUES JULY 25TH. FROM 9-4 HAS BEEN CANCELLED." This not only was a triumphant respite for Nosey, but put Pettigrew Feed & Hardware up there with many others who have cancelled shows/rides with compassion for ailing and arthritic Nosey. For this we, as advocates, have thanked them profusely. They ARE all-deserving. PLEASE, PLEASE CONTINUE TO SIGN AND SHARE. THIS PETITION IS STILL OPEN. ALL SIGNATURES WILL BE RESENT AGAIN TO USDA BEFORE EXPIRATION OF HUGO LIEBELS 2015/2016 LICENSE. THANK YOU. On 15th December Lawrence County District Court heard almost 11 hrs of testimony as to the condition of Nosey. Judge Angela Terry is still to this date 12/29 to make a ruling as to whether Nosey can remain at The Elephant Sanctuary, TN. Saturday 16th December saw Hugo & Franciszka Liebel arrested on animal cruelty charges in relation to Nosey. Both were released on $1000 bond each. They are to be in same court on said charges on Feb. 8, 2018. Should the USDA still allow a license in the interim?